www.sv2s.com • View topic - 67 Single Cab is now sold! 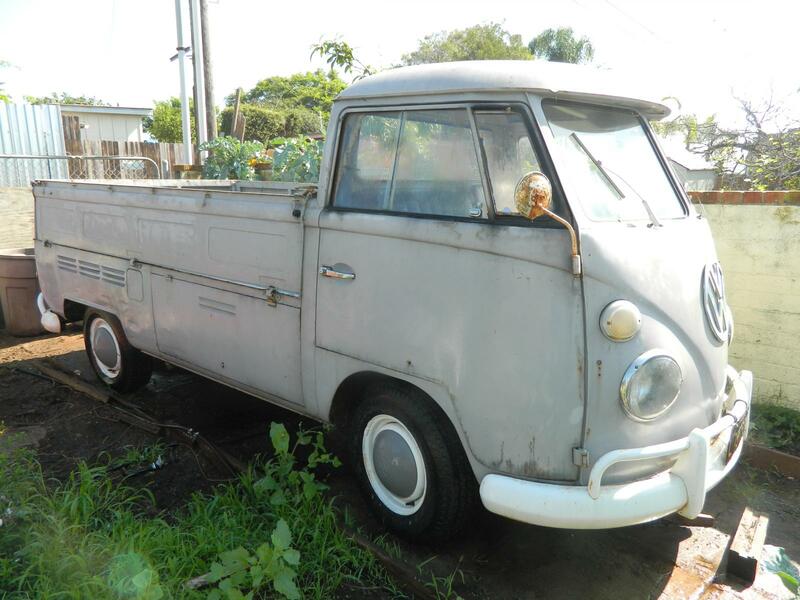 Post subject: 67 Single Cab is now sold! OK Peeps - changes **ARE** coming. 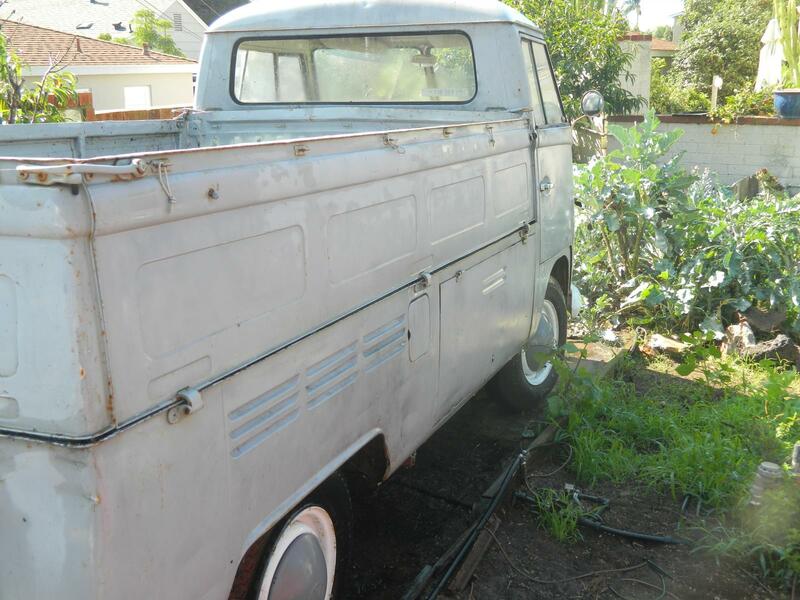 The 67 Single Cab **IS** on the market **NOW**. I bought it about 4 years ago. 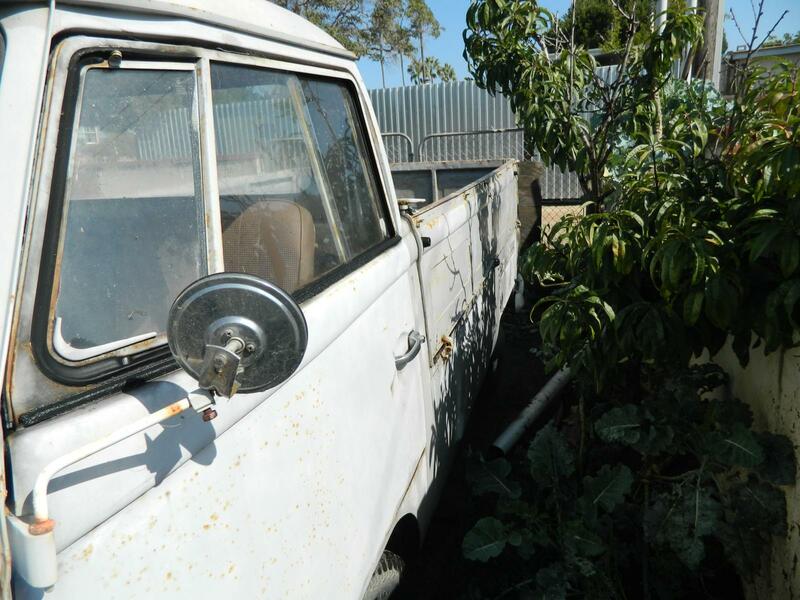 The Seller found it on a dirt lot in Santee somewhat stripped of parts. At some point it its life it had a nose replacement that was done roughly. Doors open and close with a bit of effort. I have only driven it about 2500 miles total. B. Has a 1600 DP that runs well. The prior owner bought it with the engine installed but had no idea of the internal details on the motor. C. Engine does not smoke or drip a lot of oil. It had no carb or distributor when to PO got it so he bought the finest of Chinese EMPI crap and put them on. EMPI fake 34PICT and fake 009. Considering everything it runs pretty well. D. The truck tracks surprisingly well compared to the way it was when I bought it. I found out that the (then new) tires were running at 60+ psi, the steering dampner was shot, one front shock was frozen and the other front shock was the wrong size (much longer) and finally the steering box was way too tight. Now (for a split) it tracks pretty good. E. All 4 shocks replaced with KYBs. F. Brakes were completely done (shoes, cylinders and hoses) by the PO. Brake master cylinder was not replaced but I have a brand new one that goes with the bus. G. Tires (C rated) were new when I bought it. H. Transmission (Big Nut) shifts well. I changed the fluid and it came out pretty clear. I. The bed had over 100 small drill holes in it. 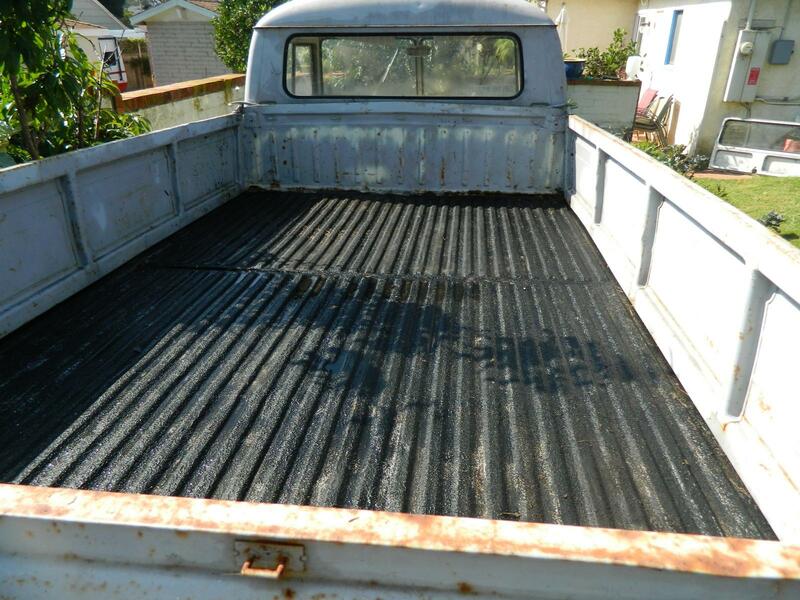 I soldered up the holes, treated the entire bed with rust converter and them covered it all with bedliner to preserve it. There is long thread over on The Samba abut this. J. Double Treasure chest which is pretty pristine with some surface rust. Spare tire included with proper hanger. K. Gates are in decent shape with just a tad bit of bow in the middle of the long sides. They open and close easily. L. Wolfsburg West replacement bumpers with overriders. They have **SOME** surface rust. M. Painted in grey primer thanks to the PO. L87 white originally. N. I'll throw in an almost pristine Bentley. If anyone local is interested let me know. Pictures **BELOW**. Last edited by OB Bus on Sat Mar 02, 2019 3:27 pm, edited 4 times in total. All electrical works: head/tail lights, turn signals, dash lights, high/low beams, backup (I'm pretty sure). 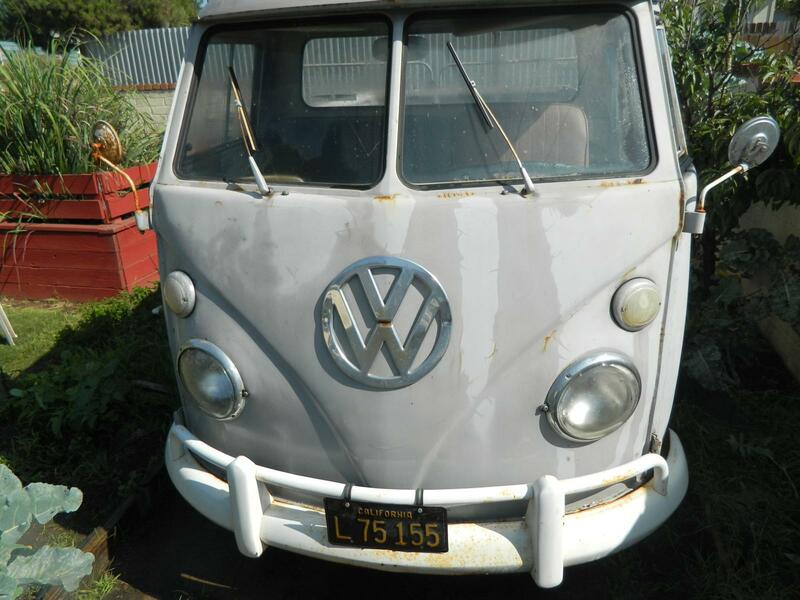 Remember -- it is is a 67 with factory 12 volts. Has year-of-manufacture black and yellow California commercial plates. Has semi-functioning vintage radio in the dash; modern one available to the right purchaser. Sorry no interior shots. Standard 2/3-1/3 seat. New cover on the driver's seat with bad padding. New cover for the passenger available. Padding on the right hand seat is OK.
Engine is stock 1600 DP. Argh, I'll take a picture next time. Front trans mount is funky. I have (but have not installed) the Wolfgang mid-mount to forever eliminate the need to screw with the front mount. Check with Ivan for installation service on that one. Rubber seals to rebuild the door sliding windows are included. Any ofter questions write or give me a call at 6 1 9 7 3 3 - ocho nueve dos dos. Sorry for the massive images. must find someone to give me money. I would love to have this. Come on lottery!!! “Small” detail which can’t tell quite right from the picture... single or dual Chester? Ah but William you would just slam the poor defenseless Single Cab. It has not been listed yet! I was trying to give the SV2s crowd advance warning to see if anyone known and local might be interested. The timing of when to sell it is dependent on a couple of other things happening first. When (and if) that time comes I will post here first. Interested? You could be an all split household. I have a "68" SC that I am considering selling as well as my "56" PG/SG is for sale! I need to thin the herd!! Just need to get motivated and put it out there. Yes that one was high on my list of comps as I was trying to set a price. The one in ^^^ that ad has a lot of nasty rust in certain places but has many areas that are much better than ours. I am notifying them of the asking price and we'll see what transpires. 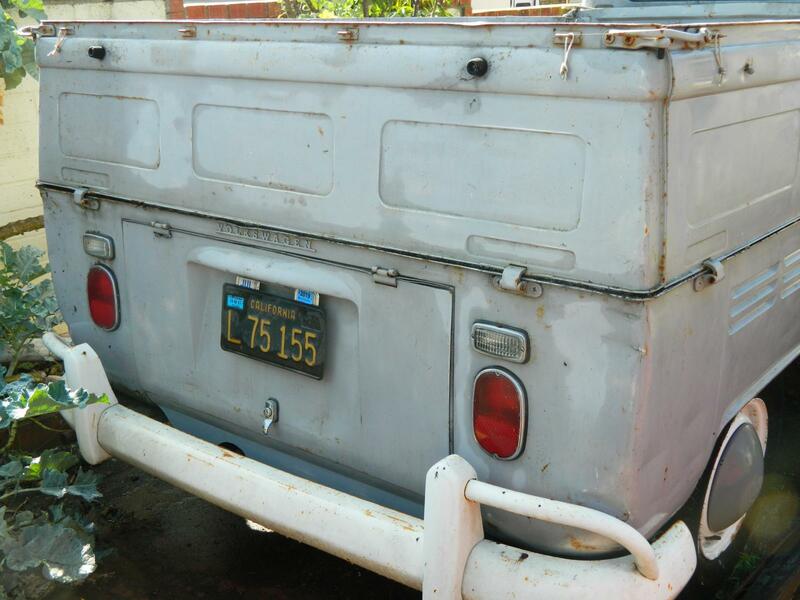 Post subject: Re: 67 Single Cab is for sale. Ad placed at 4:20 in OB! Good luck with the sale Larry! !